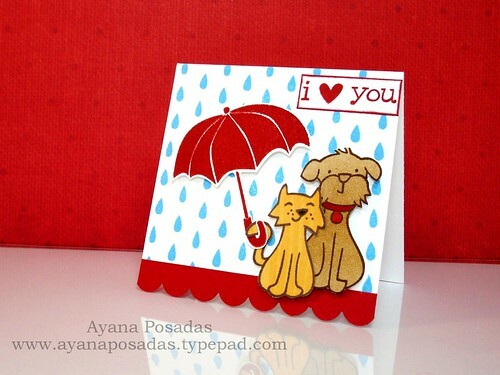 "I Heart You in the Rain" and StampFest Pics! 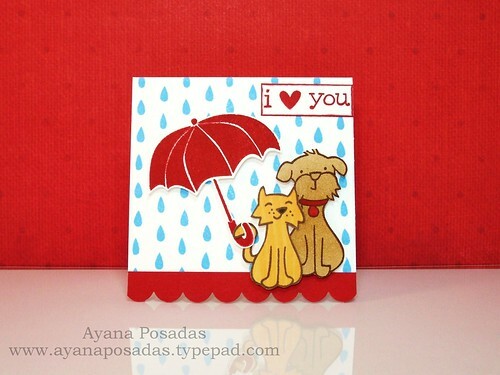 Did you notice that the umbrella is being held by the cat's tail??... Haha, I always have fun with these sets! You can check out some of my other recent LawnFawn creations HERE, HERE, & HERE. Ok, so next up... I'd like to share a few pics from this past weekend, when I went to my first stamp show, in Orlando. If you've been following my blog lately, then i'm sure you've read that I was helping out at the DeNami booth for this "StampFest" show and how I also got to finally meet up with Nami and Paulina from DeNami Designs. Ahh! I can't say enough about how AWESOME these ladies are! They were SO incredibly sweet and friendly and i'm just so happy that I got the chance to meet them in person. If you check out their blogs, you'll see how fun and talented they are... And trust me, their personalities are just as charming! Oh, and wait... there's more! I also got to meet the fabulous Wendy, from Repeat Impressions! I was very excited about this. Wendy and I have been communicating through emails and such for the past few months, so I already knew how friendly she was. But it was so nice to finally get to meet her and her super sweet husband in person! I also got the chance to meet Wendy's adorable niece! She was such a fun and happy little girl! Once again, I just want to say that because I was away this weekend, I got really behind with my Google Reader and keeping up with all your fabulous blogs. I'm in the process of catching up with things though. I sure have missed my daily doses of inspiration from you guys! Hope everyone is having a super fabulous week!!! Thanks for spending a part of your day with me!